Malayalam film actor Kalabhavan Mani took charge as the Captain of Karichal Chundan for the Nehru Trophy Boat Race, to be held in Punnamada Backwaters in Alappuzha, on August 8, 2009. 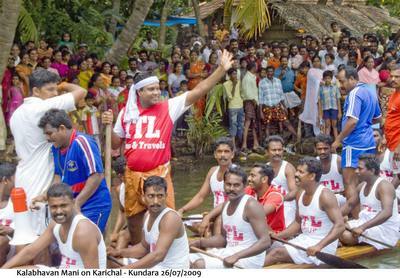 Karichal Chundan will be rowed by rowers from Kollam Town Boat Club. Karichal Chundan was last years Nehru Trophy winner. The Jesus Boat Club, Kollam, won it the trophy last year. Karichal Chundan won the Nehru trophy 13 times. Under Manis captaincy, the rowers have high expectation of winning the trophy again this year, for the fourteenth time. Kalabhavan Mani who came for the trial excited the rowers as well as the onlookers with his folk songs. The trials took place on Sunday in Kallada river, near Kollam. My Karimadi Kuttanmars will enable Karichal to lift this years Nehru Trophy too, he said with confidence while talking to presspersons. At Punnamada, the boat will have to cover 1.35 km in 5 minutes. At the trial venue at Munroe Thuruthu, Mani and his team are trying to clock 1.5 km in that time. The people of Munroe Thuruthu say the training exercise was like watching the boat race itself.